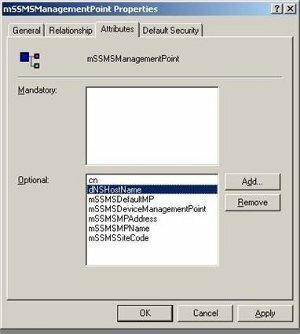 SMS 2.0 is a Microsoft BackOffice systems management tool that can both operate in and manage an assortment of network environments. Systems Management Server (SMS) enables network environments and network resources to be centrally controlled. The core control point or center of Systems Management Server is the SMS Administrator console. This is a snap-in to the Microsoft Management Console (MMC). The industry standard for Web-Based Enterprise Management (WBEM) is the core of SMS data collection and presentation. The SMS Administrator console is used to access and initiate these SMS 2.0 functions. A process known as resource discovery must be performed first to find computers, network hardware, and groups and users. SMS site: A SMS site specifies the computers, other networking hardware, users and groups, and all resources which will be managed through SMS. The SMS environment is made up of one or multiple SMS sites. You define a SMS site based on IP subnet address. Parent site: This is a SMS site that contains one or multiple additional site beneath it. Child site: This is a SMS site that has a parent site residing over it in the hierarchy. SMS site server: This is the Windows server on which SMS 2.0 is installed and running. The SMS site server is the main access point between the SMS database and administrators. The SMS server manages the SMS site and component attributes. The SMS site server must be installed on a domain controller or on a member server. It cannot be installed on a stand-alone server. SMS site system: This is a Windows server that carries out one of multiple SMS roles for the SMS site. 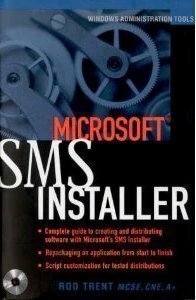 When installing SMS, the default configuration is that all SMS roles are installed on an SMS site server. Collection of discovery information on the client. Determines the site assignment of the client. Pass the client a list of client access points (CAPs). Grant/deny licenses for applications running on an SMS client. Monitor and track application usage on SMS clients. Restrict application usage on SMS clients. SMS client: This is a computer running a Microsoft operating system listed below. A SMS client is installed through the SMS client component software, an is assigned to a SMS site. Microsoft Windows NT 3.51, Service Pack 5 or above. Before you can use the SMS Administrator console to manage network resources, SMS has to first discover the network resource that you want to manage. SMS 2.0 still considers computer clients as being one of the main resources that needs to be discovered and then added to the SMS database. When SMS discovers a network resource, a record for that particular resource, called a discovery data record (DDR), is created and then included in the SMS database. The specific information discovered on a particular resource is determined by the nature of the resource. IP subnet of a computer. These discovery methods automatically create discovery records for the servers that are assigned one of the site system roles (logon point, client access point, distribution point). The site system discovery methods are automatically started by the WINNT Server Discovery Agent and the NetWare Bindery Server Discovery Agent SMS threads. This basically means that you cannot configure the site system discovery method through the SMS Administrator console. The Windows Networking Logon Discovery methods create discovery records for each resource supported by SMS that logs on to the network. 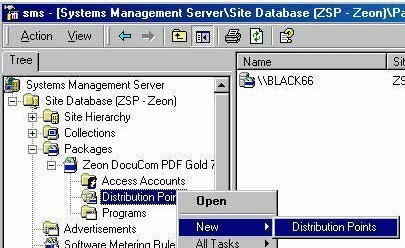 The NetWare Bindery and NetWare NDS Logon Discovery methods create discovery records for NetWare client resources. Enable the logon process through changing the logon scripts of the users. With logon discovery, the discovery data record (DDR) contains the information listed here. The exact information included is determined by the type of client. IPX addresses and IPX network numbers. Windows NT User Account discovery: This method deals with discovering domain user accounts and then adding the information to the SMS database. When you configure this discovery method in the SMS Administrator console, you can specify which domain should be utilized to discover the information. A DDR is created for each user account that is discovered. Windows NT User Group Discovery: This method deals with discovering domain global group accounts and then adding the information to the SMS database. Whn you configure this discovery method in the SMS Administrator console, you can specify which domain should be utilized to discover the information. A DDR is created for each group account that is discovered. Before a DDR can be generated, the Network Discovery method has to have IP address and subnet mask information. Heartbeat Discovery: The Heartbeat Discovery method rediscovers already discovered network computers. The purpose of Heartbeat Discovery it to ensure that the DDRs for computers remain updated or current in the SMS database. By default, Heartbeat Discovery is enabled, and you can use the SMS Administrator console to configure the Heartbeat Discovery method. It is though only active on those computers that have SMS clients installed. Manual Discovery: If you need to manually create a DDR for a specific client, then you can use the Manual Discovery method. The above client installation methods are used to install client agents. You can perform client installation before a computer resource is discovered. A logon discovery method is associated with a client installation method. To install a client agent, a user needs to be logged on to the network at computer. This is the case for all methods other than the Windows NT Remote Client Installation method. You can configure which hardware properties information should be collected by SMS. The Hardware Inventory Client Agent or simply Hardware Inventory Agent collects the actual hardware properties information from the client. The hardware inventory is stored in the SMS database. When it comes to a secondary site server, you can also enable the Hardware Inventory Client Agent on a secondary site server. The secondary site server would then pass hardware inventory information to its associated primary site, and it is then eventually added to the SMS database. File collection; locates the inventoried files in a directory on the SMS site server. Administrators can access the information by using the SMS Administrator console. Date/time when the file was created. Install software on SMS client computers from a network distribution share. Remove software on SMS client computers. Copy software on SMS client computers. The SMS client computer must have the Advertised Programs Client Agent installed. The SMS client computer must be a member of a collection. Specify the CAPs for the package. Specify the distribution points for the package. Collect the necessary source files, installation scripts etc. Define one program for the package. This is the minimum requirement. You can define multiple programs for a package. Advertise the programs to one or multiple collections. Distribute the package to the specified distribution points. Run the program being advertised on the client. You have to create a SMS package that includes the location of the source files and the package definition file (.pdf). The package definition file includes the information that would be needed to create the SMS package. The SMS package includes command-line executables as well. These executables runs on the SMS client computers to manage how the SMS package executes. You then have to distribute the SMS package to the distribution points that you have identified. Lastly, you have to create an SMS advertisement that will inform the SMS clients on the available software. Create the software distribution package for an application. Create the programs in the software distribution package. With SMS 2.0, the Definition Wizard and Distribute Software Wizard contain the PDFs. The Distribute Software Wizard is used to provide the information on distributing the software. When executing the Distribute Software Wizard, you have to select which package should be distributed. This involves selecting the Create new package from a definition option and then specifying the PDF that should be imported. Create the package source files. Create a package for the application by using the PDF and the Create Package from Definition Wizard. Define the distribution points for the package. Advertise the program(s) of the package to clients. Monitor how applications are being utilized by the SMS clients. Specify restrictions on applications based on permissions or on time of day. Recognize when unauthorized applications are being utilized. Tracks applications running on client computers. Programs not intended to be monitored are excluded. Prevents applications from being used, based on the computer name, or user account or group account. Uses software usage data to generate usage data reports. Prevents applications from being used when there is no authorization. Includes support for software license check-in and check-out for remote users. Assesses and balances license usage in sites and between sites. Includes a callback queue feature that allows users to utilize an application once a license becomes available. Site server: This is the place where you configure the components that support software metering, and specify which applications are included or excluded from the software metering process. The site server is also where you specify how many licenses are available, and the balancing of license information. Obtains configuration information from the site server. Obtains license information from the site server. Maintains and stores software usage information received by client agents. Replies to client requests for application access and licenses. Software metering database server: Used to store software metering information. The software metering database server is a separate database to the SMS database. To view information in the software metering database server, you need to use the Software Metering tool. SMS client running the Software Metering Client Agent: Clients that have the Software Metering Client Agent installed participate in the software metering process. The Software Metering Client Agent is configured by means of the site server. Pass software usage information to the software metering database server. Update component information on the client. The tool which you can utilize to both monitor and log network activity as it occurs on the network is Network Monitor. You can use the information obtained from Network Monitor to optimize network traffic as well. Network Monitor stems directly from the Windows NT Network Monitor. Network Monitor is included with Windows Server 2003 and with SMS 2.0 . You can capture frames directly from the network which you are monitoring. You can configure capture filters to specify the type of information which should be captured by Network Monitor. You can view captured frames immediately once the capture is complete, or at some later stage. You can filter captured frames by creating display filters. This allows you to find specific information in a capture. You can create triggers if you want certain actions performed when the content of a packet(s) match a predefined condition. You can edit captured frames and pass them on. You can capture frames from a remote computer. The basic Network Monitor version which is included with Windows Server 2003. The full Network Monitor version which is included with Microsoft Systems Management Server (SMS). Edit captured frames and pass them on. Resolve device names to MAC addresses. Average Server Response Time; this expert determines the average time taken by each server to reply to a request. Property Distribution; calculates the protocol statistics for a protocol property in a capture session. Protocol Coalesce Tool; for a transaction that was fragmented, this expert combines the frames to form a new capture file. Protocol Distribution; determines which protocols created the majority of the traffic in a capture. TCP Retransmit; indicates those TCP frames which were transmitted multiple times during a capture session. Top Users; determines which senders and receivers created the majority of the traffic in a capture. IP Range Monitor; creates an event when a frame’s IP address is not within a valid address range. The IP address is basically unauthorized. IP Router Monitor; creates an event when a particular IP router fails. IPX Router Monitor; creates an event when a particular IPX router fails. Rogue Monitor; creates an event when an unauthorized DHCP server or WINS server is detected on the network. Security Monitor; creates an event when there are unauthorized users capturing frames through Network Monitor. SyncAttack Monitor; monitors the network for all suspicious connections made to servers on the network. View the configuration settings of client computers. Remote Functions: Indicates whether the SMS administrator or the local user manages the level of access of the administrator. Remote access to the client must be allowed. The client must be a SMS client. The client must have the Remote Tools Agent must be installed. The Remote Tools Agent must be enabled/running. The SMS 2.0 tools have been categorized into a number of broad categories. While there are some tools that can be included in more then one category, the tool falls within the category which best matches the actual tool. Installation considerations for installing the tool. Purpose or function of the SMS tool. Area which the tool deals with or services. When you install SMS tools, you can install the tools based on category. This essentially enables you to simultaneously install the entire set of tools within the specific category. 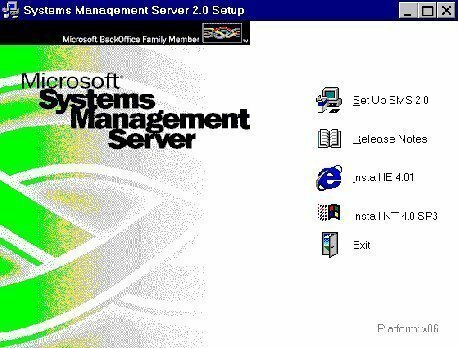 Administrator Console Setup (v20Admin.ini, v20Admin.sms): Used to install the SMS 2.0 Administrator console on a computer that is not the site server. Create a disk image of the SMS 2.0 compact disc. Locate the disk image on a package source directory. Copy V20Admin.ini to the SMSSetupBin directory of the package source directory which was created. Use v20Admin.sms as the PDF and the created package source directory to create software distribution package. Indicate which computers the SMS 2.0 Administrator console should be installed for. The package will then install SMS 2.0 Administrator console for these computers. Client Preload (CliStage.ipf): Used to install SMS client software on the computer prior to the particular computer being added to a SMS site. Query Backup and Restore (QryEdit.exe): Used to back up SMS queries and restore SMS queries. The Query Backup and Restore tool can be used to export a query from one SMS site and then import the query to a different SMS site. The tool though only works for user defined queries. You cannot use the Query Backup and Restore tool on the default SMS 2.0 queries. Delete Group Class (DelGrp.exe): Used to delete a group class and its associated tables from the SMS site database. License Reports (LicenseReports.mdb): Used to access the data in the software metering database and create reports which utilize this data. Load Site Boundary (SiteBndy.exe): Used to load site boundaries through the usage of a text file. Therefore, before the Load Site Boundary tool can be utilized, you have to create a text file that contains the list of site boundaries which should be loaded. The default configuration is that all site boundaries defined in the text file are added to the existing site boundaries. Make Collection (Makecoll.exe): Used to create a new collection from a text file of either NeBIOS computer names or IP addresses. Before you can use the Make Collection tool, you have to create a text file that includes the list of NetBIOS computer names or IP addresses for the new collection. Preferred Server (Localsvr.exe, SetSMSsvr.exe): LocalSvr.exe is used to query the SMS site database for the network abstraction layer (NAL) paths of distribution point groups and client access points (CAPs). The SetSMSSvr.exe tool is used to locate the paths in the client registry, to indicate to the client what the preferred distribution point groups and CAPs are. Query Extract (SMSExtract.xlt, SMSExtract.xls, SMSExtract.mdb): Used to extract SMS query results into a Microsoft Excel workbook or Microsoft Access table. Stop SMS services at a SMS site. Identify problems or issues in a site. APM Spy (APMSpy.exe): A command-line tool installed and executed on the client to view internal Advertised Program Manager data for a client in a format which can be read. Client Cleaner (20CliCln.bat): Used to remove a SMS 2.0 client and its associated SMS client components. Start a SMS client component. Stop a SMS client component. Specify a Start Cycle event for a particular SMS client component. Register an application to be started by the client launchers. Process Viewer (Pview95.exe): Used to display information on processes on the local or remote Windows computers using a GUI. Set Client Event Tool (SetEvnt.exe): Used to initiate client component events on a SMS client. The Client Event tool forces the Client Configuration Installation Manager (CCIM) and Copy Queue to cycle on the client, by default. You can though specify other client component events as well. Set Preferred Distribution Point and CAP Tool (PrefServ.exe): Used to define the preferred distribution point and CAP for the SMS client. Set New ID Tool (Newuid.exe): Used to allocate a unique SMS identifier (ID) to the client. Zap (Zap.exe): Used to delete a file which cannot be deleted or which is in use. Convert Schedule and Read Schedule Tools (SchedCnv.exe and ReadSche.exe): Used for troubleshooting purposes, to display schedule string in a format which can be read. Dump Error Messages (Error32.exe) : Used to display error messages for Win32 error codes. Dump Scheduler Data (DumpSend.exe): Used to display data from a Scheduler send request (.srq) file. Log Span (LogSpan.exe): Used to view SMS log file activity for a specified time period. NAL Logging (Turn_on_nal.reg): Used to enable/disable NAL logging on the SMS server or on the SMS client. It is recommended that you disable NAL logging after the information was retrieved so that the log file size can be decreased again. SMS Trace and Tracer (Smstrace.exe, Tracer.exe): Used to view log file data as it is added to the log file. The SMS Trace and Tracer tools can be installed on the SMS server or SMS client. Before you can use the tools though, you have to enable logging in the SMS Service Manager. Dump Discovery Data (Discdump.exe): Used to obtain network discovery information from the local client discovery data record (DDR). Inventory Synchronizer (InvSyncexe): Used to pass a hardware inventory resynchronization or software inventory resynchronization request to a client. Display the Management Information Format (MIF) file in a format that can be read. Verify the MIF file’s syntax. Report MIF file syntax errors and semantic errors. MIF Form Generator and MIF Entry (Mifgen.exe, Mifwin.exe): Used to extend the client’s computer inventory to contain further information. This is done through the creation of custom groups for storing the additional information. MOF Manager (MofMan.exe): Used to modify the hardware classes and attributes collected for hardware inventory. Display and view data processed through the SMS Software Inventory Processor. View data from full inventory files. View data from delta inventory files. View data from the software inventory history file. Configure Client Desktop (SetStart.exe): Used to configure a program shortcut on the Start menu or desktop of the client. Delete PDF (DeletPDF.exe): Used to remove package definition files (PDFs) from a SMS site database. Make CAP (MakeCAP.exe): Used to assign a client access point (CAP) role to a specific server. Make Distribution Point (MakeDist.exe): Used to assign a distribution point role to a specific server. Make Distribution Point Group (MakeDPG.exe): Used to create a distribution point group by using a text file. PDF Wizard (Pdfwiz.exe): Used to create a PDF from a package ID. Test Application (TestApp.exe): Used for the testing of software distribution packages. Specify the Update Enabled setting to enable/disable multisite Remote Control security settings. Set NIC Tool (Multinic.exe): Used to configure the network interface card (NIC) a client binds to. Stop Remote Control (StopRC.exe): Used to stop the Remote Control Client Agent running on a client that uses a RAS account to connect to the network. Site Properties Manager (SMSSPMan.exe): Used to create a hierarchy of sites. The tool allows you to import/export site properties using a GUI. The GUI enables you to easily copy site properties configuration from one site to another site. SMS Console Load Simulation (UILoad.exe): Used to simulate the effect of running multiple SMS Administrator consoles concurrently on a computer. The tool enables you to determine what the load will be on a SMS site when multiple SMS Administrator consoles are being utilized. Add/Remove 1.2 Console (V12Admi.ipf): Use this tool to add/remove the SMS 1.2 Administrator console from a computer which currently has the SMS 2.0 Administrator console installed. PGC Migration Wizard (SMS_MPGC.exe): Used to upgrade the PGC application from SMS 1.2 to SMS 2.0. What’s the command prompt for accessing the SMS Properties in client side ? 103 queries in 0.542 seconds.